The Bay of Fundy, on the east coast of North America. The Bay of Fundy (French: Baie de Fundy) is located on the Atlantic Ocean coastline of North America, at the northeast end of the Gulf of Maine between the Canadian provinces of New Brunswick and Nova Scotia. A small portion of the bay touches the northeast corner of the state of Maine. Portions of the Bay of Fundy, Shepody Bay, and Minas Basin, form one of six Canadian sites in the Western Hemisphere Shorebird Reserve Network, and is classified as a Hemespheric site. It is owned jointly by the provinces of New Brunswick and Nova Scotia, and the Canadian Wildlife Service. It is managed in conjunction with Ducks Unlimited and the Nature Conservancy of Canada. Covering 3,600 square miles (9,300 square km), the Bay of Fundy is well known for its tides. Both arms of the bay are macro-tidal and with 17 meters (56 ft) fluctuations, it has the highest tides in the world. The shores are misshapen with numerous coves and several large and deep water harbors. Steep bedrock cliffs form spectacular rock formations, some rising 60 meters (200 ft) high, surround the bay. Dense forests line its shores and fertile agricultural land created by dikes, from its on-land marshes, complete the scenery. In recent years the bay's greatest feature, its tides, have come into prominence as a potential source of hydroelectricity, but the complexity of the terrain make this development difficult. The name "Fundy" is thought to date to the sixteenth century, when the Portuguese referred to the bay as "Rio Fundo" or "deep river." The bay was called Baie Française (French Bay) by explorer/cartographer Samuel de Champlain during a 1604 expedition led by Pierre Dugua, Sieur de Monts which resulted in a failed settlement attempt on St. Croix Island. Overlooking the Bay of Fundy in Nova Scotia. The Bay of Fundy lies in a rift valley called the Fundy Basin which formed as the supercontinent Pangaea began to break up about 190 million years ago. The focus of the rifting began somewhere between where present-day eastern North America and northwestern Africa were joined. As the rift began to separate from mainland North America, volcanic activity occurred, forming volcanoes and flood basalts. These flood basalts poured out over the landscape, covering much of southern Nova Scotia. Sections of the flood basalts have been eroded away, but still form a basaltic mountain range known as North Mountain. As a result, much of the basin floor is made of tholeiitic basalts giving its brown color. The rift valley eventually failed as the Mid-Atlantic Ridge continued to separate North America, Europe, and Africa. The Fundy Basin is a sediment-filled rift basin on the Atlantic coast of southeastern Canada. It contains three sub-basins; the Fundy sub-basin, the Minas Basin and the Chignecto Basin. These arms meet at the Bay of Fundy, which is contained within the rift valley. From the Bay of Fundy, the Minas Basin trends northeast to Nova Scotia. Chignecto Bay runs from the Bay of Fundy northwest between New Brunswick and Nova Scotia which is separated from the waters of the Northumberland Strait by the Isthmus of Chignecto. As in all rifting environments, grabens formed. Many of these grabens were created, but for some of them, extension stopped before full rifting occurred. Where only partial rifting occurred, basins formed. By definition, a basin is any area that collects sediments. These "aborted rifts" (rifts that are tectonically inactive and no longer collecting sediments) extend from Alabama to Newfoundland. Along certain basins, rifting was not partial. Where full rifting occurred, the Atlantic Ocean was created. It is important to note that along these rifts, magmatic activity never stopped, as shown by the ongoing eruption of lava along the Mid-Atlantic Ridge. The Fundy Basin is one in a series of these failed rifts. During its rupture, tholeiitic basaltic lava erupted, producing a sequence of continental tholeiitic basalts. These tholeiitic basalts form a volcanic mountain range known as North Mountain. The upper part of the bay bifurcates, splitting into Chignecto Bay in the northeast and the Minas Basin in the east. Chignecto Bay is further subdivided into Cumberland Basin and Shepody Bay and the extreme eastern portion of Minas Basin is called Cobequid Bay. 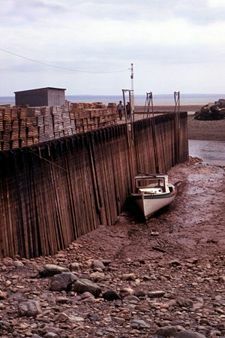 Some of these upper reaches exhibit exposed red bay muds, for which the Bay of Fundy is noted, for both their appearance and biological productivity. Cape Chignecto Nova Scotia defines Chignecto Bay whereas Cape Split, Nova Scotia defines the Minas Channel, leading to the Minas Basin. The lower part of the bay is also home to four important sub-basins: Passamaquoddy Bay and Back Bay on the New Brunswick shore, Cobscook Bay on the Maine shore, and the Annapolis Basin on the Nova Scotia shore. 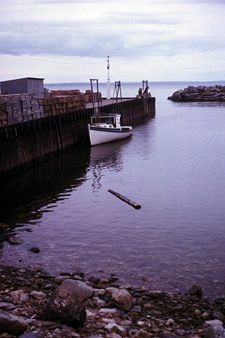 The bay is home to several islands, the largest of which is Grand Manan Island at the boundary with the Gulf of Maine. Other important islands on the north side of the bay include Campobello Island, Moose Island, and Deer Island in the Passamaquoddy Bay area. Brier Island and Long Island can be found on the south side of the bay while Isle Haute is in the upper bay off Cape Chignecto. Smaller islands and islets also exist in Passamaquoddy Bay, Back Bay, and Annapolis Basin. The Five Islands, in the Minas Basin, are particularly scenic. The Bay of Fundy in early May. The bay's extreme tidal range causes several interesting phenomena in the various rivers which empty into it. The Saint John River sees its flow reversed at high tide, causing a series of rapids at the famous Reversing Falls where the river empties into the bay, in a gorge in the middle of the city of Saint John. Another phenomenon which occurs in these rivers of the upper bay is a "tidal bore," whereby the river flow is completely reversed by the rising tide. One of the better examples of a tidal bore can be seen on the Shubenacadie River near the town of Truro and the village of Maitland, where local ecotourism operators offer the chance to experience rafting the bore upriver. Another good example of a tidal bore may be viewed on the Salmon River in the town of Truro. 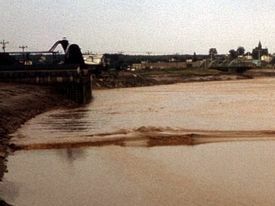 The once-famous tidal bores on the Petitcodiac and Avon rivers have been severely disrupted as a result of causeway construction in the 1960s-1970s which have caused excessive siltation. Folklore in the Mi'kmaq First Nation claims that the tides in the Bay of Fundy are caused by a giant whale splashing in the water. Oceanographers attribute it to tidal resonance resulting from a coincidence of timing: The time it takes a large wave to go from the mouth of the bay to the inner shore and back is practically the same as the time from one high tide to the next. During the 12.4 hour tidal period, 115 billion tonnes of water traverses in and out of the bay. 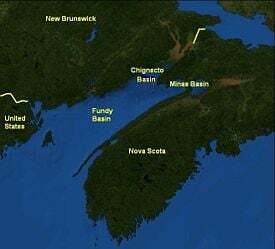 There has been an ongoing rivalry between the Minas Basin in the Bay of Fundy and the Leaf Basin in Ungava Bay, over which body of water lays claim to the highest tides in the world, with supporters in each region claiming the record. The Canadian Hydrographic Service finally declared it a statistical tie, with measurements of a 16.8 meter tidal range in Leaf Basin for Ungava Bay and 17 meters at Burntcoat Head, Nova Scotia for the Bay of Fundy. The highest water level ever recorded in the Bay of Fundy system occurred at the head of the Minas Basin on the night of October 4–5, 1869 during a tropical cyclone named the “Saxby Gale.” The water level of 21.6 meters resulted from the combination of high winds, abnormally low atmospheric pressure, and a spring tide. Leaf Basin has only been measured in recent years, whereas the Fundy system has been measured for many decades. Tidal experts note that Leaf Basin is consistently higher on average tides than Minas Basin; however, the highest recorded tidal ranges ever measured are at Burntcoat Head and result from spring tides measured at the peak of the tidal cycle every 18 years. Several proposals to build tidal harnesses for electrical power generation have been put forward in recent decades. Such proposals have mainly involved building barrages which effectively dam off a smaller arm of the bay and extract power from water flowing through them. One such facility, (the only one of its kind in operation) the Annapolis Royal Generating Station consists of a dam and 18-MW power house on the Annapolis River at Annapolis Royal, Nova Scotia, but larger proposals have been held back by a number of factors, including environmental concerns. The Annapolis Royal Generating Station has been studied for its various effects, including an accelerated shoreline erosion problem on the historic waterfront of the town of Annapolis Royal, as well as increased siltation and heavy metal and pesticide contamination upstream due to lack of regular river/tidal flushing. There have also been instances where large marine mammals such as whales have become trapped in the head pond after transiting the sluice gates during slack tide. Damming a large arm of the Bay of Fundy would have significant effects, as yet inadequately understood, both within the dammed bay itself and in the surrounding regions. Intertidal habitats would be drastically affected and a facility would bring the bay closer to resonance, increasing tidal range over a very large area. One effect could be an increase in tidal range of 0.2 m (from approximately 1 m) for certain coastal sites in Maine, possibly leading to flooding. There have been proposals in recent years for installing aquanators, the underwater equivalent to wind turbines, which would not require any damming or blockading of parts of the bay but would instead generate electricity solely by being placed in areas of high water flow, such as at choke points or merely along the floor of any part of the bay which sees significant water movement. The largest population center on the bay is the New Brunswick city of Saint John. Though up-river on the Petitcodiac, the city of Moncton is also frequently associated with the Bay of Fundy. The New Brunswick towns of St. Andrews, Blacks Harbour, and Sackville as well as the Nova Scotia towns of Amherst, Parrsboro, Truro, Windsor, Wolfville, Annapolis Royal, and Digby are also on the bay. The port of Saint John gives access to the pulp and paper industry and the Irving oil refinery. Hantsport, Nova Scotia, on the Avon River is also home to a pulp and paper mill and is the shipment point for raw gypsum exports to the United States. The ports of Bayside, New Brunswick (near St. Andrews), and Eastport, Maine, are important local ports. A result of shipping traffic has been the potential for increased collisions between ships and the North Atlantic Right Whale. In 2003, the Canadian Coast Guard adjusted shipping lanes crossing prime whale feeding areas at the entrance to the Bay of Fundy to lessen the risk of collision. ↑ Sophie Leleu, Brian P.J. Williams, and Adrian J. Hartley, The Early Infill of the Triassic Fundy Basin: Architecture of the Wolfville Formation and Basin Evolution, American Association of Petroleum Geologists. Retrieved October 20, 2008. ↑ D. J. Kontak, February 8-9, 2002, The Jurassic North Mountain Basalts, Nova Scotia: More Than Just Simple Flood Basalts, Atlantic Geoscience Society. Retrieved October 20, 2008. ↑ Parrsboro Economic Development Committee, World's Highest Tides - Town of Parrsboro, Nova Scotia. Retrieved October 20, 2008. ↑ Province of Quebec, Teaching & Learning about Canada. Retrieved October 20, 2008. Carson, Rachel. 1951. The Sea Around Us. New York: Oxford University Press. NASA Earth Observatory. Bay of Fundy. Retrieved September 27, 2008. Russell, Franklin. 1966. The Secret Islands. New York: Norton. Thurston, Harry. 1990. Tidal Life: A Natural History of the Bay of Fundy. Camden East, Ont: Camden House Pub. ISBN 9780921820154. Western Hemisphere Shorebird Reserve Network. Bay of Fundy. Retrieved September 27, 2008. 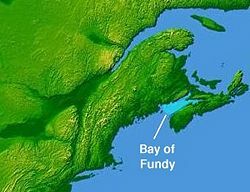 History of "Bay of Fundy"
This page was last modified on 24 May 2016, at 16:36.